This is the slogan of Samantha Cohen’s new Foundation she and two friends started in the summer of 2013. They want to help get the word out about sickle cell disease and help those who suffer from this illness. Diagnosed with sickle cell disease when she was a baby, “Sammie” as her mother, Kelleye, calls her has grown into a strong, compassionate, positive young woman with such effervescence for life. Her smile brings sunshine to any room. The family moved from New Jersey when Sammie was a baby, and they had their first introduction to Sinai Hospital when she was 9 months old and had a fever that would not break. Kelleye calls Sinai their “extended family.” They have gotten to know all the doctors and nurses extremely well over a 14-year period, and have adopted them into their family. At age 2, they learned that Sammie was susceptible to strokes, so they started the transfusions every 4-6 weeks as a way to try and prevent them. At 4, she had her first operation – a spleenectomy. When Sammie was 7 she suffered a major stroke, despite the preventive measures of the blood transfusions. While at the hospital she suffered a seizure. Kelleye remembers her nurse, Arlene, breaking down in tears seeing Sammie struggle so much. After she came home she suffered two minor strokes. When Sammie went back to school after the strokes, she had a slight speech impediment and some weakness on her left side, but continued with her great grades and kept a smile on her face. 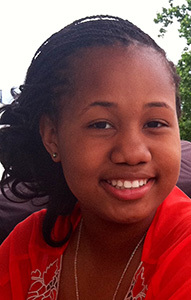 After her strokes, Sammie was diagnosed with Moya-Moya disease – a rare brain disorder resulting from complication of Sickle Cell and had corrective brain surgery. After the surgery Sammie was frustrated that they only shaved half of her head and so asked her mother to shave her hair into a Mohawk. She proudly displayed her new “do” to friends and family. In 7th grade, Sammie began to develop side effects from her stroke. Kelleye and her husband Reginald decided to home school her. Although Kelleye lives in fear of another stroke and watching Sammie endure the painful symptoms of her Sickle Cell Disease is difficult, she does not let this dampen her strong spirit. Sammie sees her “second family” at Sinai every four weeks for her blood transfusions – something she will continue for the rest of her life. Her mother and she have developed a ritual where every night before her transfusion they stay up all night watching movies and eating whatever Sammie wants. She is put under for every transfusion, and each time wakes up with her trademark smile. As a parent, you never want to see your child suffer. When Sammie went to school, Kelleye would sit in the parking lot all day waiting for her to come out – worried something would happen to her while at school. There have been many times when Kelleye needed extra strength and the Pediatric team at Sinai has provided that strength. As a thriving 14-year old, you would never know about Sammie’s illness from talking with her. She talks excitedly about her new Foundation, her love of singing, the great relationship she has with her brother, Myles, and how much she looks up to her mother as her role model. She has proven she is “Stronger than Sickle Cell” and has her second family at the Herman & Walter Samuelson Children’s Hospital to thank.